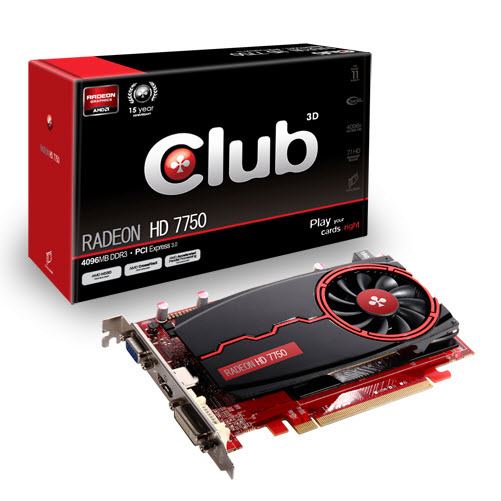 Club 3D presents today its latest addition to the Radeon HD 7000 series, the Radeon HD 7750 4096MB DDR3 and Radeon HD 7750 1024MB DDR3 graphic cards. 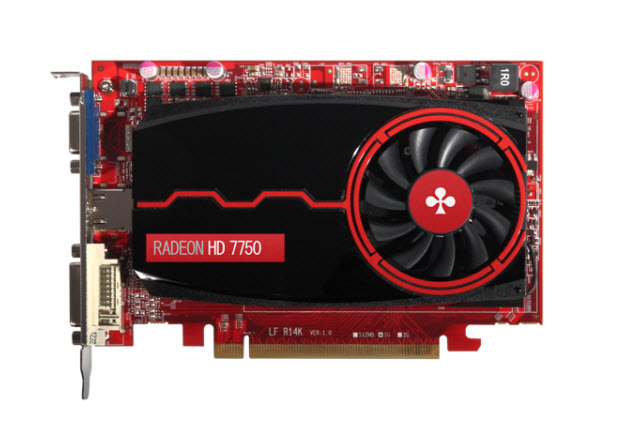 The Radeon HD 7750 4096MB DDR3 offers an incredible amount of memory frame buffer for those budget minded gamers and the Radeon HD 7750 1024MB DDR3 comes at 12% lower price compared to the Radeon HD 7750 1024MB GDDR5, offering great value. Both cards utilize a custom cooler design with a single slot 50mm fan that ensures the card to remain cool at 57 ⁰C on average when gaming, extending the lifespan of the card and operate stable at high speed. The Radeon HD 7750 DDR3 cards also consume 3W less power under load and is fully powered through the PCI Express interface, meaning it does not require an external power connector, offering more compatibility with older generation power supplies. Run games at full HD by upgrading from your old onboard graphic card and boost performance by up to 7x compared to previous generation Radeon graphic cards. * Add more and faster memory and enhance your internet experience, watching online video’s, photo and video editing has never been this smooth and fast, experience true speed with the Club 3D Radeon HD 7750 4GB DDR3. The Radeon HD 7750 offers great performance with the GPU clocked at 800 MHz and the memory at 1600 MHz, with an overclocking headroom at 900 MHz for GPU and 2000 MHz on memory and Beyond. The Club 3D Radeon HD 7750 4096MB embodies the maturity of the 28nm process, and the scalability of the Graphics Core Next architecture. This card also features an extension to AMD Powertune technology called “ZeroCore Power”, which allows the graphic card and its components to save power by dynamically adjusting both voltage and clockspeed to a mere 3W with ZCP idle mode enabled. AMD is introducing with the Southern Islands chipset their long idle power saving technology. Now the graphic card can turn off most of its functional units of the GPU, when they are unused, leaving only the PCI Express bus and other components active. This as a result, reduce the power consumption from 15W at idle to under 3W in long idle, a power level low enough that ZeroCore Power shuts off the fan as there is no heat generated further saving energy. ZeroCore Power will put CrossFireX™ grapics cards in ZCP mode when not in use. A revolutionary new architecture. Jump right into GPGPU applications today with Microsoft C++ AMP™ and OpenCL™ for spectacular performance with the GCN architecture. From video editors to Internet browsers, AMD App Acceleration™ is a supercharger for everyday applications. The Club 3D Radeon™ HD 7750 was engineered for the revolution in GPU compute. 4 years after the introduction of PCI-E 2.0, the all new PCI-E 3.0 specification is now introduced. Providing 1GB/sec per lane bidirectional, which for a X16 device means 16 GB/sec, doubling 8 GB/sec on the previous generation. With the introduction of the HD 6000 Series, HDMI 1.4a implementation allows the graphic card to enable Stereo 3D on HDTVs or monitor displays, this same feature is also found on the new HD 7750. Now with the introduction of HDMI support for 4K x 2K displays, the HD 7950 is now able to run 4K x 2K displays (max resolution 4096×3112) over HDMI along with being able to support 1080p Stereo 3D at 120fps (60Hz/eye), with the current standard set at 48fps (24Hz/eye). AMD HD3D is a technology designed to enable stereoscopic 3D support in games, movies and/or photos. Additional hardware (e.g., 3D-enabled panels, 3D-enabled glasses/emitter, Blu-ray 3D drive) and/or software (e.g., Blu-ray 3D discs, 3D middleware, games) are required for the enablement of stereoscopic 3D. Not all features may be supported on all components or systems—check with your component or system manufacturer for specific model capabilities and supported technologies. AMD HD3D technology is enabled on ATI Radeon HD 5000 Series GPUs and above using Catalyst 10.10 or later, however Blu-ray 3D playback is only supported on AMD Radeon HD 6000 Series GPUs and above. Take Handbrake, for example. Handbrake is a world renowned, open source video transcoding utility for Mac OS®, Windows® and Linux®. Millions of people use this application every day to prepare videos on their PC for use on the road with smartphones or tablets. Over the past year, AMD has worked closely with the development team to introduce OpenCL™ acceleration into the transcoding pipeline, and the performance is exceptional. Other applications used by millions of people every day, like WinZip, can now leverage the tremendous compute power of Graphics Core Next, too. Compared to both processors and competing graphics cards, AMD Radeon products can free system resources and get you back to work more quickly. Efficiency was a corollary goal. By transitioning to the industry’s first 28nm process, we could design an architecture that not only packed more compute units into a given space, but more complicated and capable compute units. Any of our GPUs can offer more performance than analogous products from previous or competing architecture and the HD 7750 is just the graphic card you are looking for, low power consumption while making quick work of applications like Adobe® Photoshop® CS6.